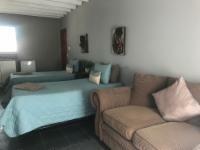 Tula@159 B&B offers comfortable accommodation. 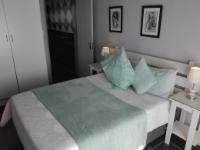 Self-catering units can accommodate 1-4 guests each. 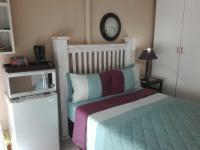 All units with full DStv and free wifi. Guests also have the use of a bar fridge, and we provide tea and coffee-making facilities. The property offers safe under cover parking behind an electric fence and there are CCTV cameras. The establishment is situated in the Universitas suburb of Bloemfontein, close to the University of the Free State and Universitas Hospital, which are both less than 2 km away. The establishment is also close to the mall, the Waterfront Shopping Centre, Free State Stadium, Grey College, Rose Park Hospital, and most of the popular Bloemfontein attractions and restaurants. Family friendly: There is an outdoor play area for children. Thank you for allowing the late sign-in. We appreciate being able to be accommodated so late, as we would've been stranded in Bloemfontein, not having a car ourselves and also not familiar with the town layout. Tula@159 B&B is 0.5km from the centre of Universitas , the nearest airport 9.9km (New Tempe Airport).